CALGARY – Canadian Natural Resources is picking up most of Shell Canada’s oil sands properties in a pair of deals worth $12.74 billion. The cash portion consists of $11.1 billion, and Shell will also receive almost 97.6 million Canadian Natural common shares worth approximately $4 billion. As holder of nearly 97 million Canadian Natural common shares, Shell will have a 9% interest in that company. Shell is stepping away from most of its oil sands projects as part of its $30-billion divestment program. 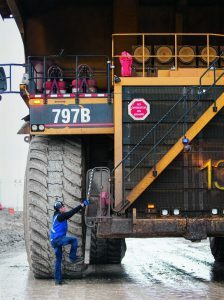 The first deal, worth $11.1 billion, will see Canadian National acquire the bulk of Shell’s oil sands holdings, specifically 60% of the Alberta Oil Sands Partnership., including the Muskeg River and Jackpine mines and bitumen recovery facilities north of Fort McMurray, Alta., and a 70% interest in the Scotford upgrader near Edmonton. Canadian Natural also obtains Shell’s in situ Peace River assets, including Carmon Creek, and a number of undeveloped oil sands leases. Shell will remain the operator of the Scotford upgrader and Quest carbon capture and storage project. In a separate $2.50-billion undertaking, Canadian Natural is acquiring half of Marathon Oil’s 20% stake in the AOSP, bringing its share to 70%. Shell is picking up the other half, leaving it with a 10% interest in AOSP. This is an all cash, deal worth $2.50 billion. A total of 3,100 Shell and Marathon employees will join the Canadian National payroll. The arrangements are due to close in mid-2017. Please see either www.CNRL.com or www.Shell.ca for details.